My good friend Juanita Benedicto, librarian extraordinaire, has been living in Mexico for the last year or two, working remotely and helping out at a convent, orphanage, and women’s shelter. She blogs about life in Mexico from time to time, and today’s post was pretty amazing and inspiring. Once a week, a young couple—he is sitting on the bench, she’s on the curb and they’re both reading to a child—fills a suitcase full of books and rolls it out to the plaza in Mexiamora. They set the books out and children come to read the books, some with their parents. In a Country where wages are low and book prices are high, books are a luxury. Especially children’s books. I think it’s incredibly forward-thinking for this couple to create their own book mobile and dedicate an afternoon every week to give their neighbors the satisfaction of reading and being read to. The plazas that fill Guanajuato unite neighbors and create friends. Every evening, this one is filled with people sitting and talking, kids playing, and sometimes, impromptu dog parks….How wonderful that these spaces can become homes to portable libraries as well. Juanita also coordinates donations to help build library donations for the convent, Buen Pastor. If you’re interested in sending money or Spanish children’s books her way to help out, you can find out more here. Schiller taught SEO as both a means to understand how web search can be “gamed,” and also, incidentally, to help students understand underlying principles of web design & searching. Consider the DIALOG blue sheet: old-school way of making sure your expensive data search worked, before you did it and were charged on a per-minute basis. Sheets showed what fields you could search, etc. Honed librarian search skills. Principles of SEO are a blue sheet for the Web. Not as controlled b/c the overall environment isn’t as controlled. But has listing of fields to search by, description of language to use, understanding of how the tool we’re interacting with works. First principle: Google isn’t magic. Google & web search are often denigrated as quick, easy, type in search to get subpar results. Want users to be empowered and engaged users of the tool. Want us to remember this too. Best way to show this is to reveal the architecture underneath. Second principle: bits & atoms behave differently. Digital objects obey different rules than physical objects. Libraries are designed around the rules of physical objects. Third principle: Google tries hard to impersonate a database. In fact a very heterogeneous collection of items online; opposite of a database. Google tries to emulate the things that let us search a database with precision and clarity. Fourth principle: Google leverages the capabilities of digital objects. Not forced to reduce relationships between digital items, can do many things with digital that don’t work with print. The Anatomy of a Large-Scale Hypertextual Web Search Engine, by Sergey Brin & Larry Page, explains the steps that Google uses to search. Users often want “Google-type” searches, so we create keyword searching options–but in fact keyword-matching search isn’t very efficient. (And libraries have been able to do it for a very long time.) Google isn’t just based on matching words, but on ranking results. What users want isn’t matching, but ranking. Google does very well at results ranking. 1. They create externalized metadata, because they can’t get good metadata off most Websites. 2. They also do page ranking, inspired by academic citation analysis–deciding importance based on how many others are using a work. Incoming links become significant data. 3. Tags and text! Anchor text: the description text for a link (the word itself, usually blue and underlined on the web page that’s linked from.) Anchor text is basically volunteer cataloging that describes the nature of the thing being linked to. (This is why Google bombing works.) Information in a URL is more significant than information used elsewhere in a page. Title text is also vital information, that’s weighted highly. Meta name tag is also weighted highly: the text in the <meta name=”description”> field is what is displayed in the Google search results. Basically serves as an abstract, which means it’s more important than data in the body of the text. Heading tags <h1> <2> etc. are also implied important. Understanding these things helps explain why search results are arrayed/ranked as they are. Google isn’t just retrieving everything on a topic; it’s giving specific hits based on predictable rules. Using search operators like site: and allinurl: help reveal the underpinnings too. Bridges & Edmunson-Morton did a study on image-seeking preferences of undergrads at OSU. Noticed undergrads using their phones a lot, heard from students that they tried to start research, didn’t find anything, assumed nothing was there. Anecdotally: Google is main starting point, and students expect library websites to work like Google. Archives/libraries start wondering: how are students using mobiles or even laptops with Google going to find anything? Assumption: students blindly accepting what they’re given. Not true; they’re smart about searching, use Google, but have good sense of what they’re getting. Problem is ability to establish context; they’re cherry-picking. Doesn’t work in archival research. Started using Flickr Commons: project started by Library of Congress and Flickr for copyright-free image sharing from LoC. Multiple institutions applied to join. OSU was first university in Flickr Commons. Since then, Yahoo bought Flickr, layoffs everywhere. High hopes for Flickr/Commons as research tool and interaction with users as well as fun image-sharing tool. Not necessarily borne out. People are using OSU images on Flickr Commons (especially after a recent post on Etsy about them) but it’s not ‘academicy’. Not really meeting users where they are, because they’re not using Flickr Commons for research. They are using Google, though, and Google gets them to Flickr. Women dancing with veils at the May Day Pageant, from the OSU Flickr Commons collection. Adobe recently commissioned The Visual Literacy White Paper, which discusses visual literacy as seeing in your mind, merging language with the visual, interpreting what’s in images. Discussing visual literacy with undergrads can be easier than “information literacy,” bibliographies, finding aids, etc. Are faculty assigning work to students that requires visual literacy? Talked to faculty: one faculty member said even if he didn’t tell students to use images, they would. There is very little research on digital image use or visual literacy in instruction. Anecdotally, class syllibi didn’t tell students where to get images or how to cite them, etc. Students tending to use them as “add-on” to the assignment. Tiah and Laura hired OSU survey research center to help conduct statistical survey. One substantive question: students were asked to imagine being asked to find images of people logging in Oregon in the 1930s or 1940s, and explain their search process for finding a picture. Audience at Online Northwest session was given the same survey, asked to fill it out, and discuss: how much information about images do you want/need? where do you find images? were you ever taught to read images? if so, where/when/how? 11 went to library/librarian (after Google) Of these, 7 specified they’d go to the library to get a book. Books were usually the last step of a multi-step process. So were librarians. So…most students used Google, and many stopped there. No student mentioned any concern about copyright. No students discussed how they would evaluate the image (except for 2 who specified “a credible picture.”) Over half of students said they’d used Wikipedia for an assignment in the past, but none mentioned Wikipedia in this response. Most students didn’t know what archives were. Many students think that archival holdings are all/mostly online. 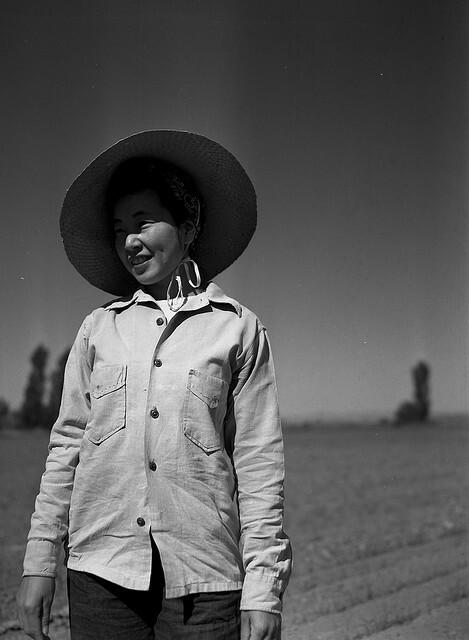 Portrait of a Japanese American woman from the OSU Flickr Commons collection. So…librarians should consider adding visual literacy instruction to info lit instruction. Finding images, citing images, copyright, etc. Computer programmers and analysts should work to raise the rankings of library collection images in Google and Google Images. One method is to put them into Flickr; these rank higher than contentDM images in Google. Presentation site available here. Includes a “getting started” PDF, links to resources, Prezi template. Prezi is a “zooming presentation editor.” Means you have an endlessly big canvas. Everything you add to the canvas is a separate element. In top left corner is a “bubble” menu (below.) Command line is along top at center. You can simultaneously edit a presentation in real time with another user. Different levels of Prezi access available: public (free), “enjoy,” and pro. Both “enjoy” and pro cost. 100 MB, 500 MB, and 2000 MB storage space respectively. An academic email address (.edu) gives you free access to the “enjoy” level. Create an online account with Prezi, can create templates for presentations. With “enjoy” / .edu account, can make your account private, public (anyone can search prezi.com to find it) or public-allow copy, which allows members of the public to save a copy of the template. Moving & scaling elements: Transformation “zebra” is the navigation tool. Outer ring is to navigate around the screen. Inner ring is to scale objects. 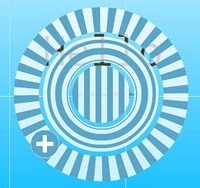 Very center is to select element and move around. More here. Prezi is theme-driven, and you have only 3 options for colors/fonts per presentation. Can change these with the bubble menu (top left of write screen.) Ten themes are included. There’s now a theme wizard that allows you to devise your own theme. Can use CSS if you want. 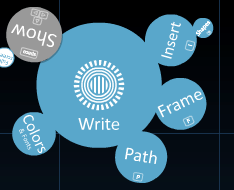 Prezi uses frames (an option in the bubble menu) to draw boxes around elements. Frames appear as grey brackets on the write screen, around certain elements that you want to show as a single view. Scale the frame around the size of element you want to show–smaller frame = tighter zoom in on the elements. Insert button on the bubble menu: allows you to load files (images, etc.) Prezi hates JPGs, wants PDFs. Convert before uploading. You can embed Youtube videos easily. Can upload .swf files if you insert coding. Can also insert shapes, colors, etc. for emphasis. Path button on the bubble menu: set path by clicking, numbers will appear to show where the camera will move, in which order. Can download presentations to local machine/server. When it’s offline it’s an .exe file (local Flash player) that you can’t edit (unless you get the Pro version of the software.) Will download as a zipped folder, but you can extract only the .exe file and play it on either Mac or Windows. If you embed YouTube video or other online content, must be online to show those. Can also get an embed code for the Prezi presentation. Can use Prezi to create tutorials (instead of Captivate/Camtasia.) Narrative model rather than lecture model–opens up presentation to different frame/scope. Especially lends itself to presentations with a conceptual aspect, with both a whole and parts that you want to discuss–as opposed to simple linear ideas, which work well for slideshows (PPT, etc.) Some libraries have used them for library floorplans, showing where things are located in the library. Another good use: “narrowing topics” for students, showing successive zooms through broader to narrower topic focus. Other uses: mind-mapping, brainstorming. Prezi uses a “frame” metaphor for presenting information, rather than a “slide” metaphor: you can choose how much content to show in a frame, zoom level, etc. Paths add another layer, since you can move from one element to another, back, onward, back again, and so on. 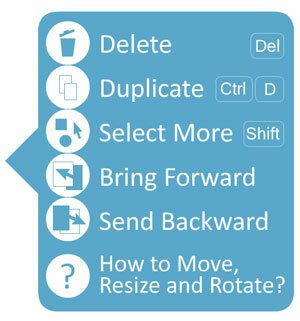 Depending on settings, user can navigate through in any direction they want. Official Online Northwest blog is here. Is #onw11. Twitter feed is here. I’m on the conference planning committee for Online Northwest, so I’ll definitely be attending–and I encourage everyone reading this within a 400-mile radius of Corvallis, OR to attend too! The program is looking great, with sessions on e-books, presenting with Prezi, search engine optimization, cloud computing, QR codes, and more. I’ll try to blog some of these sessions, and we’re asking some of our volunteers to blog and Tweet as well. If you can’t make it there, follow us from afar!